Our sleek Modern Wood Tower Award makes an elegant statement your award winner will be proud to display! 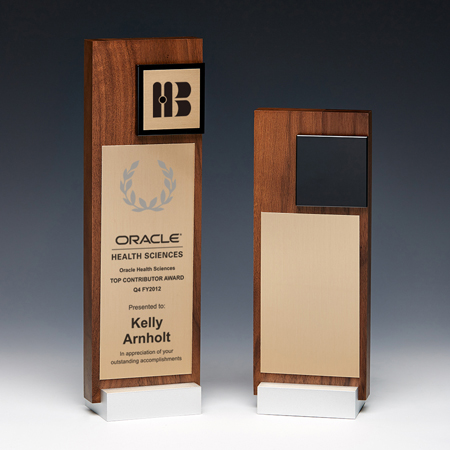 In two sizes, this contemporary corporate award features a walnut wood block with a black optical crystal square above a golden engraved plate. The base features a simple aluminum stand. Your corporate logo and customized text are included for FREE! White Rectangle Name Badges -1"x3"
White Rectangle Name Badges -1.5"x3"